Parents Bound to Collective Agreements and Local Contracts? Nobody has been able to answer me yet, but I'm wondering if parents are bound to the collective agreements and any local contracts. I'm thinking about this mostly in regards to strike action. But I'm sure there are others areas where it can also be applied. Parents have not signed anything giving up their rights to anybody else. Any negotiations regarding collective agreements, strike action and local issues that affect me have not gotten my approval. I am not saying that all areas need to have parental approval, but certainly more parental consultations into what is eligible for strike action, etc, should be allowed. I'd like to see more efforts made by districts and DPACs to get this type of information out to all parents. The fact that teachers can refuse to give out report cards is ridiculous really. The fact that a parent can have an issue with their child and be told, "Nope, bell to bell" My union won't let me talk to you. I could get in trouble." Seriously? Definately doesn't fly with me and I know many others as well. I am not really sure how this would look, but definately think more parental input into areas of bargaining that affect them is required. Big time! Is Teacher Quality Really Most Pressing Issue Facing #BCEd? Very good blog post on Teacher Quality by @mrrcho on Twitter. He is an excellent follow if you're on Twitter. Very insightful, a genuine advocate for education. Thank you for letting us repost your article! I agree with the author that Teacher Quality is not the big issue it's made out to be concerning our education system. Although there are some areas related to Teacher Quality that I feel really need to be addressed, overall, I'd say that it's not even the most pressing. The most pressing issue in BCs education system is the dysfunctional relationship between the BCTF and the government. Hands down. The majority of teachers in BC are top-notch and worth much more respect than they're currently getting. I think if the issue of this dysfunctional relationship can be tackled, we'd see teachers and their noble profession getting the respect it deserves in BC. 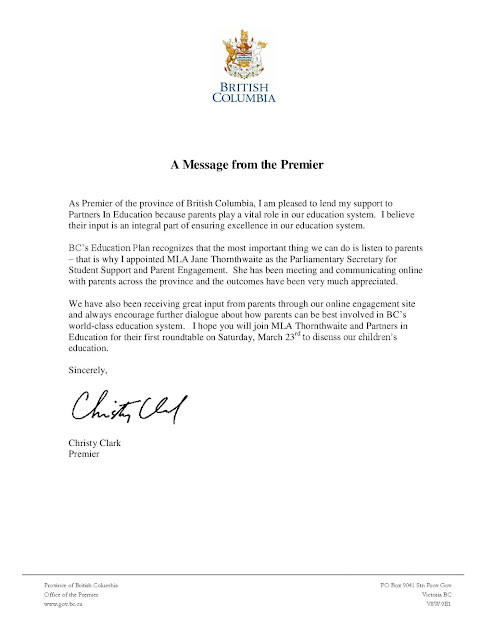 BC Partners in Education is very honoured to receive a letter of support from Premier Christy Clark. 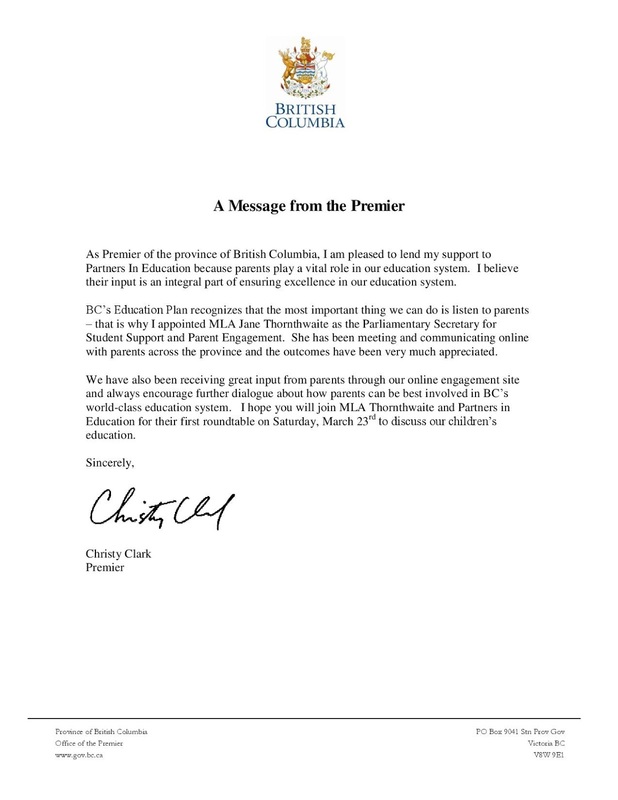 The BC Liberal government recognizes the vital role parents play in our education system. I am pleased to share her letter of support with you! Wow. Just Wow! Following is an article from the Vancouver Sun regarding an ex-Olympian charged with having a "flirtatious" online relationship with a student. So many things wrong with this story. The boyfriend of the student reported the disgusting emails from the teacher. The teacher then creates a private email address and CONTINUES the relationship after being confronted by his school. Wow! Guess what happened to the teacher? Charges were dropped! And the student states how "gross" she feels and transfers schools. I want to know who is standing up for these kids? Disgusting! Related Article: Who is Teaching Your Kids? Had a very familiar conversation with a parent of a special needs child, Jane, today. She has a daughter with autism and spent a couple years in the public system and then transferred to a private school. It's been quite a challenge finding all of the services her daughter needs to give her the best chance for a happy, fulfilled life. Like myself, Jane was a bit overwhelmed when her daughter went into the public school system. Your autism funding drops drastically when your child turns 6 years old. The assumption is that the school system picks up where autism funding has been reduced. The reality is that there just aren't the services available within the school system to meet all of these needs. Necessary speech and occupational therapy is at a premium. Occupational therapy is almost impossible to get at school. So, even though doctors and therapists will give recommendations, schools are not able to comply. So, what does a family do? That's a good question that many parents struggle with. What do we do? You end up making some tough choices on how to use your funding. Sometimes secondary insurance plans will provide some help and community services. You need to be a really strong advocate for your child and research programs. This isn't easy for lots of parents to do for a variety of reasons and end up frustrated and confused. My friend Lisa has a couple children with learning disabilities. They have had major challenges getting what they need at school. I have another friend Sue, who is told to keep her child home 1/2 day because the school isn't able to deal with all of her son's needs. Because of this, Sue is unable to work and they need extra help from the government to get by. You may be surprised, but schools telling parents to keep their kids home is not as uncommon as you might think. I need to check and see if there are any stats on this. How do these kids get what they need? Who is advocating for them? There has to be options and there needs to be somebody helping these families through the maze of education and community services. Programs for special needs kids need to improve. Childcare for special needs kids needs to improve. With lack of funding in education and community service sectors, we need to build stronger relationships with businesses and our communities. I'm not sure exactly what the answers are, but I'm looking forward to hearing what candidates propose in this upcoming election. I wanted to repost this article over here from my personal blog. I think it's very applicable to Parental Rights in BCs education system. I highly encourage you to read it and understand what little you know about who is teaching your kids. 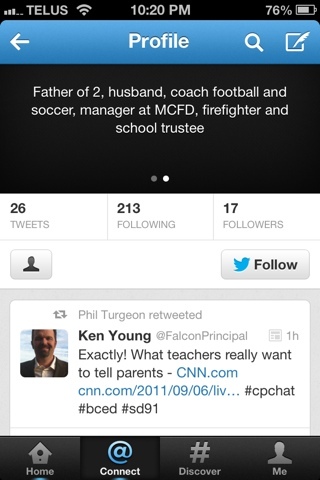 I'm very interested in discussion on what information parents are entitled to know about their kids' teachers. What information should be kept private? Not so sure I'm happy with the Teacher Regulation Branch quite yet either. The disciplinary measure is very weak in a few of these cases. Makes me question the impartial judgement of who is overseeing disciplinary proceedings. Very happy with the progress in transparency, but clearly there is lots more work that needs to be done. I'd like to hear your comments on Who Is Teaching Your Kids? I was quite disappointed to see some of the comments following. We all know some parents very clearly fit that description, but it's really unfortunate to see the proverbial "high fives" afterwards. I was also disappointed in seeing the Vancouver Sun pick up the article without really mentioning the other part of the story. Parental rights in education are really dismal right now. Parents have virtually no say over who teaches their kids. Teachers are disciplined, suspended and often just shuffled off to another school. Parents are virtually unaware of this past history of their teachers. Parents with special needs kids are subject to the local school and school board determining what is best for your child, with very little history or knowledge of your child. Our kids are so quickly used as pawns in political battles between the BCTF and whatever government happens to be in power. Just amazing the lack of respect there. Amazing! Thank you to L.M. from Salmon Arm for forwarding me this document, THE NEW EDUCATION MALPRACTICE LITIGATION by Ethan Hutt & Aaron Tang. I have finished most of it and found it quite interesting on the effects of teacher quality being paramount to a successful student. I highly recommend you read it, but understand it could take awhile! The interest around Partners In Education has been developing stronger and faster than we had expected and we are now experiencing the “joy” that comes with growing pangs. We are in need of help in seeding start-up costs of what many have called a “much needed” and “refreshing” effort to open the dialogue in BC’s education system to students and parents. Administrative costs are now presenting as a challenge to effectively and efficiently continue the great work and success we have been achieving for parents as we partner with them for the betterment of BC’s education. We are currently looking to raise $1,000 to file the necessary paperwork for non-profit status and better set up communications efforts in reaching out to the many partners in education throughout the province. · Financial contributions, to help seed our accruing start-up costs. · Starbucks gift cards, to help with face to face meetings that occur with our partners. 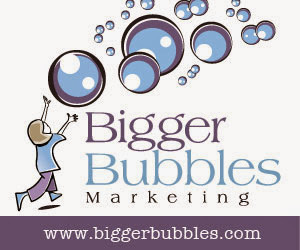 · Gas cards, to help with the growing interest in presenting regional round table meetings. · Financial contributions are not the only way to help. We are also looking for help with researching issues relating to parental rights and community involvement in education in BC. If you have any stories you think we'd be interested in knowing about, please drop by our “Contact” page above.